Today I’m reviewing my favourite climbing shoes. Uppers are synthetic Lorica® for durability blended with leather for comfortable performance. Suede footbed and synthetic Taibrelle lining maintain a good fit. I have to start by saying…’The force is strong with this one! !’ …right? Ahem..
As I’m thinking about writing a review on a climbing shoe..it seems almost pointless. To own a great climbing shoe, you must be at one with the climbing shoe! It’s a deep personal relationship you must foster on your own, though a review can be helpful for pragmatic reasons. Some choose climbing shoes based on performance, who sponsors the shoe or what their buddies have. Me, I base my decision on 1 thing. Comfort. That’s it! I choose the most comfortable shoe at the smallest size possible. This is my second pair of these and since my 1st pair, I have gone down a size. I’ve noticed a substantial difference in my performance since going down a size. I climb outdoor sport. I’ve started doing multi pitch and having a comfy shoe that stays on for hours is key. These are by far the most comfortable shoe at the smallest size that I’ve ever tried. I’ve probably tried on 25-30 pairs since I started climbing and have owned several pairs. I have a size 12 foot, so finding climbing shoes can be tough as they usually don’t make them remotely close to that size. With climbing shoes, you always go down in size, but it can be difficult to find a shoe that fits when ya got big feet. If you happen to have bigger feet, these might be a good solution for you. 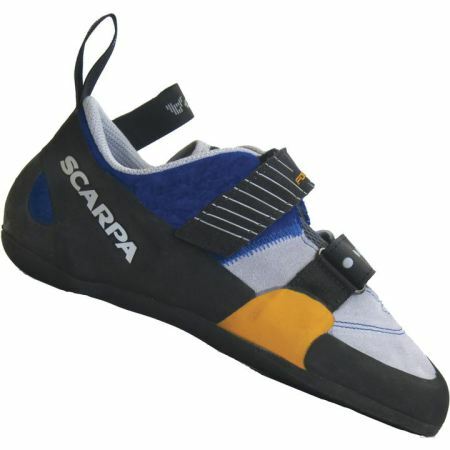 Scarpa makes larger sizes that other manufacturers do not. I think if you get more than a year out a shoe and you are an avid climber (2+ times a week + trips), that’s about all you can ask for. I had my 1st pair of these for 1.5 years. What goes 1st are the sole in the big toe area. Everything else was holding strong! For most people, the ideal climbing shoe can handle different types of climbs. Designed for all-day comfort, long climbs, and varied vertical terrain, these shoes are the best solution for a climber who only wants one pair. All around shoes should fit close (but not tight). Look for a shoe with a firm, supportive sole and a wide, flat profile. Avoid shoes with a radical downward curved shape that curls your toes. Lace-ups provide a more versatile fit, slip-on shoes tend to be tighter and less supportive. After a short break-in period, a good all around shoe should fit like a tight running shoe. Experienced climbers may want a shoe designed specifically for the terrain they plan to tackle. For extremely steep or overhanging routes, look for climbing shoes with a pointy toebox and an aggressive down-turned or hook-lasted shape. Shoes with a down-turned shape are built with a pre-tensioned, or “slingshot” rand that drives the foot forward and centres your weight over the big toe. They suit precise foot placements or heel-hooks on gnarly overhangs. If this sounds like you, consider shoes with a thin, soft, sensitive sole. Slippers, or shoes with hook-and-loop closures are also good because they can be worn very tight and removed quickly when you’re through. Dedicated crack climbers should look for a climbing shoe with a high rand and a stiff midsole that will reduce the pain of cramming your feet into hand-width cracks. Climbers who are negotiating finger-width cracks might opt for slightly softer shoes with a narrow profile that allows you to twist a toe into a thin seam. Avoid shoes with a radical down-turned shape; they tend to curl your toes, which can generate more power on very steep routes, but can be exquisitely painful when jamming a crack. A well-fit, comfortably snug shoe can mean the difference between a sublime climbing experience and a foot cramping endurance festival. Climbing shoes are constructed on anatomically correct lasts. Meaning, they are contoured to fit an average size foot, of average width, with perfect arches and shapely toes. Unfortunately, your feet are unique. It’s best to try several brands and styles to find a manufacturer’s last that best matches your foot. Women’s feet are generally narrower than men’s, and they usually have a thinner Achilles tendon, lower ankle bone notches, and a higher arch and instep. Women may want to avoid climbing shoes with high-cut heels as it will dig into the Achilles tendon. In addition, some shoes have a rand up to the top of the shoe that can cut into the heel. When trying shoes, look for the fit that combines comfort and the least possible dead space, as extra space will affect precision. Sadly, there is no definitive answer to this question. Rock climbing shoe volumes have three basic characteristics: they allow your toes to lay flat, slightly bend your toes, or push your toes down into the front. Ideally, a shoe should be snug and glove-like without extra space at the toe or slippage in the heel – without being cruelly tight. All climbing shoes will stretch a little bit (unlined shoes will stretch more) and conform to your foot. However, a shoe will not get longer. Too short is too short.